Enjoy traditional pierogi in Poland! As the crisp autumn temperatures settle in, the best way to warm up after a long day of adventure is to enjoy a home-cooked meal. A person’s idea of comfort food depends on their specific tastes and cultural upbringing, but regardless of the dish, it instills a sense of nostalgia and contentment in all. This season, explore another side of your taste buds — and sample our favorite comfort foods throughout Europe! The French may have perfected the art of fine dining, but that doesn’t mean they can’t enjoy an oversized meal from time to time. Steak Frites, also known as steak and fries, is best served at Bistrot Bert, a classic bistro located in the center of Paris. The fries are thick and crispy, and the steak is served with a rich cream sauce of black peppercorns and Cognac. Enjoy this meal on a cold autumn day, and don’t forget to order a glass of red Bordeaux. The strudel is to Prague what the pie is to the United States. This sweet, flaky pastry is filled with walnuts, dried fruits, and cinnamon sugar. The apple strudel is best enjoyed with a hot cup of coffee and a generous portion of whipped cream. The best part about eating apple strudel in Europe? You can enjoy it at any time of the day! If you associate “comfort food” with fried food, you may fall in love with the wiener schnitzel in Austria. The dish involves a thin cutlet of veal, fried to perfection, and served with a large portion of potatoes. This meal is best enjoyed slowly and with a frothy mug of cold beer. Almost every culture has their own version of delicious, irresistible dumplings. In Poland, they’re known as pierogi, and they’re served in various ways from sweet to savory. If you don’t have a Polish grandmother to make pierogi from scratch, visit Mała Polana Smaków to enjoy this dish like the locals! 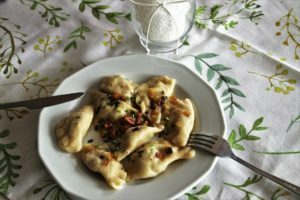 Traditional pierogi are best served with a chilled glass of Polish Chardonnay. This entry was posted on Wednesday, November 14th, 2018	at 10:54 am	. You can follow any responses to this entry through the RSS 2.0	feed. You can leave a response, or trackback from your own site.